The Big muff is one the favourite circuit of guitar pedal builders (with the Tubescreamer). Indeed, its circuit is really well known, there is a lot of information available all around the internet, and it is really easy and fun to modify! Each component plays a particular role, and changing it for a different value will change the overall sound of the pedal without damaging the circuit most of the time. It is one of the most cloned guitar pedal, by DIYers or by boutique companies: Mojo Hand FX, Earthquaker Devices, Pete Cornish... Almost every brand has its version of the big muff! The first section (input section) is simply a buffer to adapt the impedance of the guitar to the first distortion stage, and which amplify also the signal. As OP amp did not exist at that time (1973, remember? ), this is made with a transistor wired in common emitter. Today, a simple OP-amp would be enough! First, there is an input resistor which will diminish a bit the amplitude of the signal. Then, a coupling capacitor will remove any parasitic DC current that mights come from the guitar. Changing the values of the coupling capacitor and input resistor can changes the amount of bass and trebles of the big muff. That is how I made the switch on the pedal. A bigger value resistor and a higher capacitance for the coupling capacitor will increase the bass response of the unit. Then, a transistor wired in common emitter will amplify the signal. Depending on the amplification of this stage, the saturation will be more or less important. 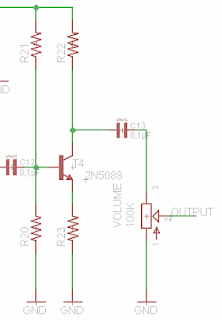 The amplification is set by the different resistors on this circuit. 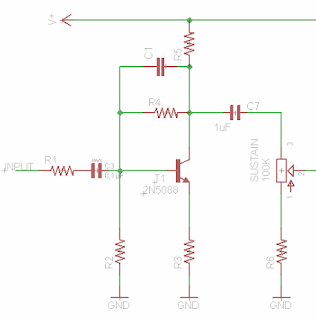 Changing resistor's values can increase or decrease the overall gain of the unit. Next, there is a coupling capacitor (again), and a potentiometer wired as a variable resistor that will allow the user to set the amplification on this stage = gain of the Big muff! The second and third part (first and second clipping second) are in fact exactly the same circuit. 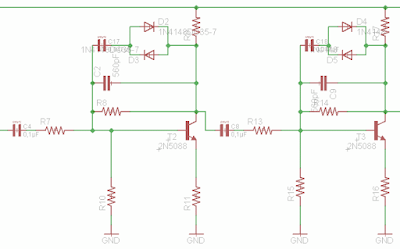 It is used to distort the signal, through the clipping induced by diodes. There is first a coupling capacitor (if you look carefully there is one at each section's start except the tonestack), followed by a resistor. Then, there is a transistor wired in common emitter like in the first part of the circuit with resistors to define its gain. A 470pf capacitor will allow more or less trebles to go through the section. Changing the three 470pF capacitors for a larger value (like 560pF) will diminish the trebles of the unit. This is the case in many clones, like in the Iron Bell from Mojo Hand FX for instance. The diodes will clip the signal and generate the saturation. In classical Big Muff, silicon diodes are used, but in some "boutique" clones, germanium diodes clip the signal (pharaoh fuzz for instance). With germanium diodes, there is less volume, and the sound is even more compressed and saturated! 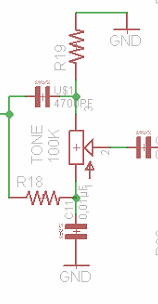 For more infos about diode clipping, read my article about the Jan Ray circuit. The third part of the circuit is for me the most important part, the tonestack! This little circuit is what gives the characteristic sound of the Big Muff, and the medium loss, the enemy of guitarist playing in a band. Indeed, when you loose mediums, you litteraly disappear from the mix, as if the guitar was muted! Read a precise analysis of this part of the circuit here! A lot of mods do exist to avoid that: a switch which modify the values of the resistor linked to the ground or the 4,7nF capacitor (which I did on this Big Muff), or to use a potentiometer instead of a resistor, and modify the values of the components to have flat mids, to have a proper medium knob (AMZ tone stack). It is also possible to replace the tone stack by another one, like on the Pete Cornish G2. You will loose the Big Muff style distorsion for a much classical overdriven sound. You can even remove it! You will then have an "in your face" sound with a lot of mediums. You can find this system on the Dwarcraft Eau Claire Thunder for instance. Experiment by yourself, the tone stack is a simple circuit and changes a lot the sound of the Big Muff. A lot of fun! Finally, in the output / volume section, the signal is amplified again (to prevent volume loss due to the diodes clipping). It uses a transistor wired in common emitter biased to have a strong amplification. A coupling capacitor is present, followed by a potentiometer wired as a variable resistor to modulate the output signal amplitude. We can recognize (again !) the volume control of a fuzz face! I really advise you to make a muff once. It is really fun to make and to mod. After reading the Big Muff page, you will know exactly what to change to make it sound like you always wanted! Big muff Page: THE website about big muffs! All the versions, schematics and more! A must read for muff lovers. Big muff mods and tweaks: Some easy mods for your big muff. They are easy but funny mods!